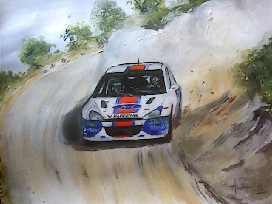 Colin McRae, Nicky Grist hard at work in the Ford Focus W.R.C. - Acropolis Rally 2001. 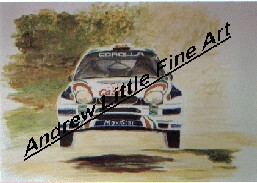 Acrylic painting, 20"x16"
Didier Auriol - Seat Cordoba World Rally Car - Rally of Corsica 2000. Carlos Sainz ? 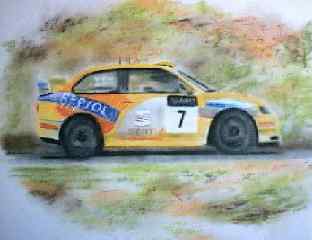 Colin McRae ? Take your pick. 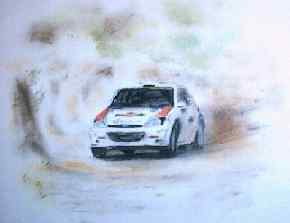 Both were deserving of praise for their efforts in the Rally of Portugal. 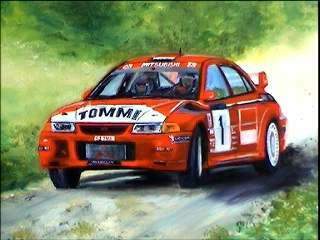 Ford Focus World Rally Car..
Tommi Makinen - 1999 Mitsubishi Lancer World Rally Car. 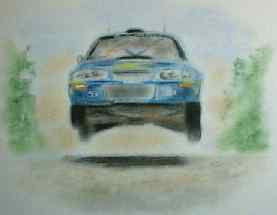 Richard Burns and Robert Reid reach for the sky - Subaru Impreza 2000 season World Rally car. Carlos Sainz and Luis Moya get airborne as well in the 1999 Toyota Corolla World Rally Car.